Buy childrens 7ft wide playhouses and wooden playhouses online at cheap prices! With a large selection of wooden playhouses to choose from we are sure you will find the perfect playhouse / wendy house for your child. All of our wooden playhouses are manufactured to the highest quality to ensure that they conform to EN71 Outdoor Toy Safety Standards. These include safety features such as safety styrene glazing and safety hinges (so little fingers do not get trapped). iLikeSheds wooden playhouses are constructed from high quality tongue and groove timber, which is planned to a smooth finish. Our wooden playhouse and wendy house range incorporates our popular 6’ x 6’ Dutch Playhouse and the 8’ x 6’ Bramble Playhouse which both provide a large space for your children to play in. 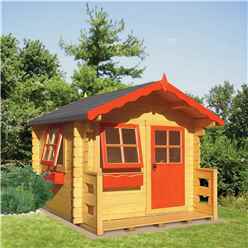 If you are looking for a smaller wooden playhouse to suit a smaller garden we would recommend the 4’ x 4’ Snug Playhouse which is made from the same high quality timber as the Dutch and Bramble Playhouse and provides the perfect playhouse for the more compact garden. 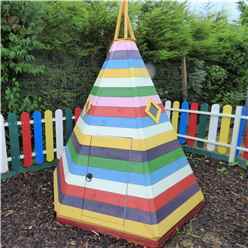 We sell a selection of tower playhouses. The 5ft x 7ft Tulip Tower Playhouse and 5ft x 7ft Tulip Tower Playhouse and slide are wooden playhouses which are raised above the ground level to add extra excitement. They include a ladder and have a slide as an optional extra. The 4ft x 4ft Stockade Tower Playhouse is a great lookout tower for children to play within which will give hours of fun and happy memories. We offer free delivery*, and express delivery options to selected postcodes – 48 Hour – Saturday - Sunday – Pick-A-Day. We offer a wide range of Children playhouses in a number of sizes and styles. Some include single or multi levels, internal lofts, or are part of an activity centre. Your choice should depend on how much space you have available and how many children are likely to be using the Playhouse. The smallest playhouses can fit in almost any garden and are great for one or two children to play in, whereas larger playhouses, particularly when raised and attached to play systems, are best suited to small groups of children in larger gardens. The site of the playhouse needs to be firm, flat and ideally in sight of the main house. 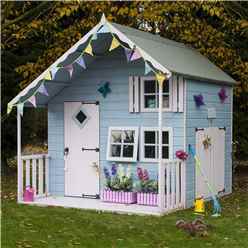 Try to position the playhouse away from areas of the garden which suffer from wet patches, or close to prickly or poisonous shrubs. Also avoid placement adjacent to sharp corners of paving, walling or other garden hardware. All of our playhouses come complete with a floor, so all you need to do is make sure the site is clear, firm and level. We recommend constructing on concrete or paving slabs. If you have a large garden and the playhouse is in an exposed position it may be worth considering anchoring or storing it during the winter months. General specification includes a full length safety hinges on the entrance door and safety styrene windows. No slam catches are fitted to all doors included. Playhouses with raised floor levels have safety rails on the veranda sections as do internal loft areas. All of our timber playhouse designs have been independently inspected and they all meet or exceed the requirements of European Toy Standard EN-71. Our high-level tower playhouses have a substantial wooden framework with a four leg support system. If you are unsure about the firmness of the ground, or wish to make a 100% permanent level base, consider setting the legs in concrete postmix to give extra support. Your wooden playhouse will provide years of fun and entertainment for your children, requiring little more than occasional application of quality timber preservative. Periodically check the roof covering for splits or tears and repair accordingly to ensure durability of the playhouse.